Freshen up your bedroom with the enchanting style of Intelligent Design's Khloe Comforter Set. The stunning comforter flaunts a geometric, metallic silver print against a vibrant aqua ground for a fun and eye-catching look! Matching sham(s) echo the design seen on top of the bed to pull the entire ensemble together. Two embroidered decorative pillows with typography and metallic details complete this fabulous, ultra-soft microfiber comforter set. Set includes comforter, 2 shams (1 sham in Twin/ Twin XL), 1 oblong and 1 square decorative pillows. I'm known to buy several beddings until I'm happy with one. I try it out, see if it matches my room in the long run. When I bought this, it was very pretty, the comforter isn't to durable for a toddler, so that was the only down side. Other than that, for the time I had the bed set, it was rather nice and pretty. Love the bright teal color and the silver is what sold me on this comforter! The silver makes it pop and is not over done so it looks very nice and beautiful. The fabric is soft and love that it’s not heavy but more lightweight so great for So Cal weather. My only complaint is the pillows look a bit cheap and the threading on them is not done very well, as it’s thin in areas. But I added some pink pillows and others and you don’t notice them as much. I’m happy with the price and comforter set. Beautiful comforter set, perfect in XL Twin size for my daughter's dorm bedding! The color is a beautiful pale aqua color with silver accents. Bedding appears to be high quality. Love it! Accent pillows are adorable! Was hoping this wouldn't have a cheap, cheesy look to it with the metallic embellishments, and it doesn't. It's very pretty and chic and the side with the silver accents is still nice and soft, and the reverse side, a darker teal is a nice soft brushed fabric. Bought for tween daughter for Christmas and she was thrilled with it and likes the decorative pillows that came with it also. Got it on sale during cyber week and definitely feel it was worth about $40 for the twin size set. Haven't washed it, so can't say how it holds up to that, but so far, very pleased! This comforter set was such a great price for all of the pieces that came with it. The shimmer on the comforter really shines and the throw pillow is a nice pop of contrast against the comforter. I bought this set for my 11 year old niece who has a full size bed. It can be a challenge to find a comforter set for a tween that does not look "boring" or "mature" and this set was perfect!! My Daughter fell in love with the Intelligent Design/ Silver Metallic comforter she said it was extremely comfortable and plush and that she loved the design it also fit her Queen side bed perfectly and was exactly what she hoped for. I will definitely be purchasing more comforters from Overstock in the future.This definitely gets 5 stars. Simply Beautiful! My daughter picked it out for her room and absolutely loves the colors and designs. The color is vibrant and the accent pillows are plush and cute! The comforter is rather comfortable too even with the silver designs. The color of this comforter is vivid and beautiful. The fill is evenly distributed. this comforter is good quality, the fill in the pillows is firm. I am pleased with my purchase! Soft and pretty. Waiting to see how the silver will hold up after washing. The two pillows are well made. The 5 piece comforter set is lightweight. It is also great to have it feel next to your skin THe big plus was the 2 cute pillows that came with the set. Received faster than expected. Love this bedding. Exactly like the picture! Very soft and comfortable and holding up very well. I have washed it once already and have seen no issues with the colors running or the silver ruining. I acually love this! I'm gonna make it work with silver curtains and rug. You can also get the aqua skirt to match! The color was so vibrant and bright. Beautiful beautiful comforter!! 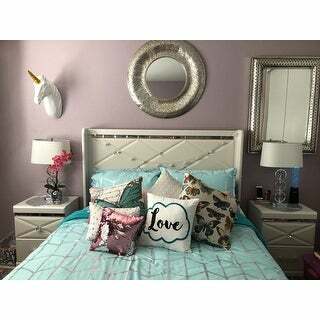 The colors are very nice and I will definetely order again.... i never have complaints from Overstock!! Thank you sooo much!! Really love this comforter set. Light weigh and very soft. Brightens up the room. This comforter added flair and pizazz to my daughter’s room and the quality is great. I’ve washed it several times with no problem. Would recommend. Bought this set for my 10 year old daughter. She loves the color and how soft the set is. The comforter is warm but not too warm so it’s great for N.C. nights. The accent pillows were cute but not of the best quality. Overall happy with the purchase. Nice and soft. Really pretty color. The reason for 4 stars is that within the first week one stitch broke. I love my comforter set, it's very beautiful with the matching curtains. I would love to have it in the pink/gold. My daughter has really enjoyed decorating her room with this comforter set. "Are there any sheets that would match either color on the comforter, whether it's the lighter color or the reverse side? My daughter LOVES her set but I'd like to get sheets to go with it." "Is there a matching bedskirt for this set?" No, a matching bedskirt is not available for this set. "Need a bed skirt to match since this is really not large enough. What bed skirt matches?" "Is this comforter machine washable"
"What is the thread count on this"
The thread count was not stated. It was beautiful! It was bought as a gift for my daughter and she loved it. It was of good quality and would highly recommend. Niece picked it out! She loves the design! I got this and love it. fits great and the color is wonderful! very nice product!